Vaccines, modern agriculture, computers, evidence-based policies – scientific research produces enormous benefits to society. But from climate science to cancer biology, science is facing a replication crisis. Lots of research findings can’t be repeated and billions of valuable research funding dollars might be wasted in the process. There’s a new and better way of doing and publishing research, called Registered Reports, where research is peer-reviewed before the results are known. We’re crowdfunding for Professor Chris Chambers to work on getting scientific journals to adopt Registered Reports. Your donation is processed by GoFundMe and goes directly to Professor Chris Chambers at Cardiff University. $75,000 would free him of teaching and administrative duties at Cardiff University for one year. This format is applicable to a lot of areas in science and might help with the replication crisis. Our first crowdfunding campaign, Let’s Fund #1, is raising funds for Professor Chris Chambers, the leading proponent of Registered Reports. This will free up his time to focus on accelerating the widespread adoption of Registered Reports by leading scientific journals. This ‘meta-research’ project might be exceptionally high-impact because we can cause a paradigm shift in scientific culture, where Registered Reports become the gold standard for hypothesis-driven science. This campaign is raising funds for Professor Chris Chambers, the leading proponent of Registered Reports. Chambers is a Professor at Cardiff University. $75,000 would free him of teaching and administrative duties at Cardiff University for one year. Your donation will enable him to spend 50% of his time to focus on advocacy to accelerate the widespread adoption of Registered Reports by leading scientific journals. Summary: Why donate to this campaign? Scientific research produces enormous benefits to society. Developing medicines and vaccines, modern agriculture, computers, and evidence-based policies based on research that tries to find which ones work and what works best – all of these rely on the scientific method and have saved and improved millions of lives. Read our in-depth analysis on why donating to research might be very high value. Unfortunately, a lot of research findings are false and science is now facing a “replication crisis”. When repeating experiments, researchers from many areas of science are often unable to get the same results – with potentially billions of dollars of research funds being wasted in the process. We believe rather than donating to say cancer research by itself, it’s better to donate to ‘meta-research’, which tries to improve many areas of science at once, from economics to cancer biology. One particularly promising meta-research project is the new Registered Reports publication format. 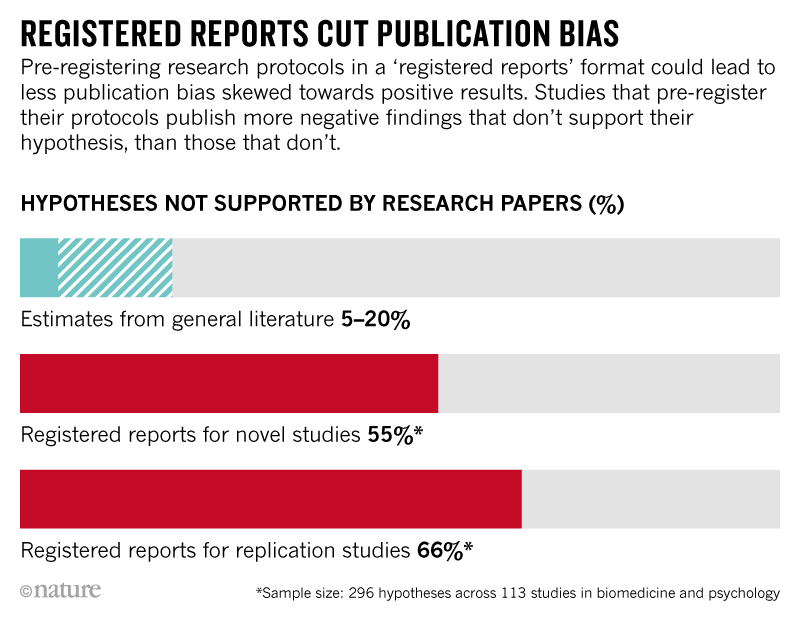 It’s a new way of doing science that’s trying to help fix the replication crisis. Instead of scientists doing all the research and then submitting it for publication, they first write up the theoretical motivation and exact experiment and analysis they’re planning to run, submit that to the journal, and the research is approved if the method is sound – without the results. Only then are the experiments run, and the results submitted. This leads to more theory-driven research, leaves less room for fishing for findings from data that didn’t fit the original hypothesis, and means researchers have an incentive to publish research even when nothing was found (and you would want to know if scientist found that a medicine didn’t work!). Registered Reports has the potential to improve the scientific method – and so increase the bounty that scientific research produces. Read our in-depth analysis of the benefits of Registered Reports. We want to fund Professor Chris Chambers at Cardiff University, the co-inventor and a leading advocate for Registered Reports, to work on getting more scientific journals to adopt this new standard. A buyout from his teaching would free up his time and our cost-effectiveness analysis suggests that he can advocate for journals to adopt the new format for between $365 and $1460 per journal. Even though this is a good start, there are more than 25,000 scientific journals, and there is still a lot of room for advocacy. But if enough reputable journals adopt this new format, then this might cause a paradigm shift in scientific culture, where Registered Reports would be seen as the gold standard for hypothesis-driven science. This would make whole fields, ranging from climate science to cancer biology to economics, more theory-driven, reliable and robust. Read our in-depth cost-effectiveness analysis of Registered Reports advocacy. See endorsements for Registered Reports and Chris Chambers below. How does Registered Reports work? Authors of Registered Reports initially submit a Stage 1 manuscript that includes an Introduction, Methods, and the results of any pilot experiments that motivate the research proposal. Following assessment of the protocol by editors and reviewers, the manuscript can then be offered in principle acceptance, which means that the journal virtually guarantees publication if the authors conduct the experiment in accordance with their approved protocol. With this in hand, the researchers then implement the experiment. Following data collection, they resubmit a Stage 2 manuscript that includes the Introduction and Methods from the original submission plus the Results and Discussion. The Results section includes the outcome of the pre-registered analyses together with any additional unregistered analyses in a separate section titled “Exploratory Analyses”. Authors must also share their data on a public and freely accessible archive … and are encouraged to share data analysis scripts. The final article is published only after this process is complete. A published Registered Report will thus appear very similar to a standard research report but will give readers confidence that the hypotheses and main analyses are free of questionable research practices. “We live in an age of information, but the quality of information is variable. Science is not immune to the growing suspicion that information that is provided may be selective or that there may be unintended (or even intended) biases in what is available. Scientists are increasingly seen as working toward a personal agenda rather than working towards the public good.